Can you believe it is easter already! It’s been a big few weeks, but I will go into more details later on, as it is way too much for one post! It took a while to get motivated, as I like knitting without a lot of shaping, and also I didn’t want Squeak to see it and work out what it was. The pattern was written differently that I am used to, so I made quite a few mistakes which meant I had to knit the head twice. 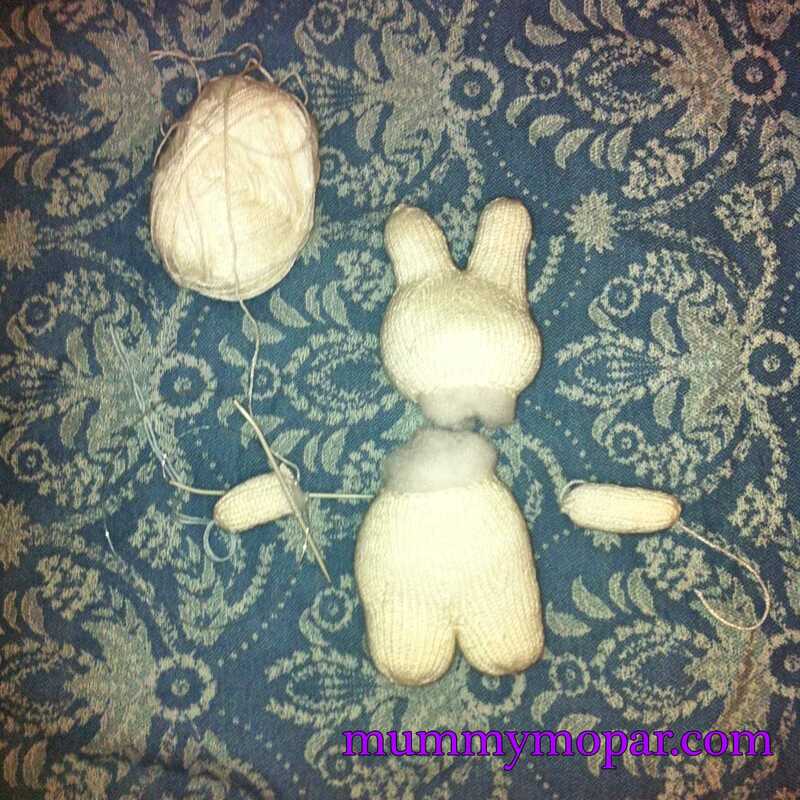 I will need to knit another one the same very soon, as where Squeak is, Miffy must be. A spare is definitely needed. Especially since Miffy is a creamy white, and Miffy already had a chocolatey mark on her, and she is only 2 days old. We were invited to an easter hunt this afternoon, easter monday. I had looked for a nice easter t-shirt in the shops, but I hadn’t found one I liked. We did have some plain t-shirts she was outgrowing, so I got my collection of scrap fabric, and my heatnbond roll out. I googled Miffy colouring in pages, and found three I liked. I decided that it didn’t matter if they wouldn’t last long term, as it was mainly for easter and if they lasted longer then that would be a bonus. I am happy with the longsleeve t-shirt, as the face details are the best. In the future I will have to embroider the face after I iron the Miffy on, so you can’t see the shadow of loose ends of embroidery floss. This was technically a no-sew project, but I have my doubts about the longevity of the Miffys, as the light pink one started to peel off yesterday, the first day of wear. I didn’t take any shortcuts with the iron on adhesive, I am a little disappointed, but Squeak is so close to outgrowing the shirts. I might use this technique of layering fabric to make a cute shopping bag, but I think the background fabric being stretchy might have contributed to the peeling. It might also be good for a quilt, Imagine how excited Squeak would be if she had a Miffy quilt! I have been working on finishing some unfinished projects, and bought more yarn. There was a 30% off sale at lincraft so easter bunny bought me 2x100g balls in each of 5 colours, and a pattern book. DaddyMopar is eagerly awaiting a jigsaw puzzle I ordered for him, that we will do together. Isn’t easter great? 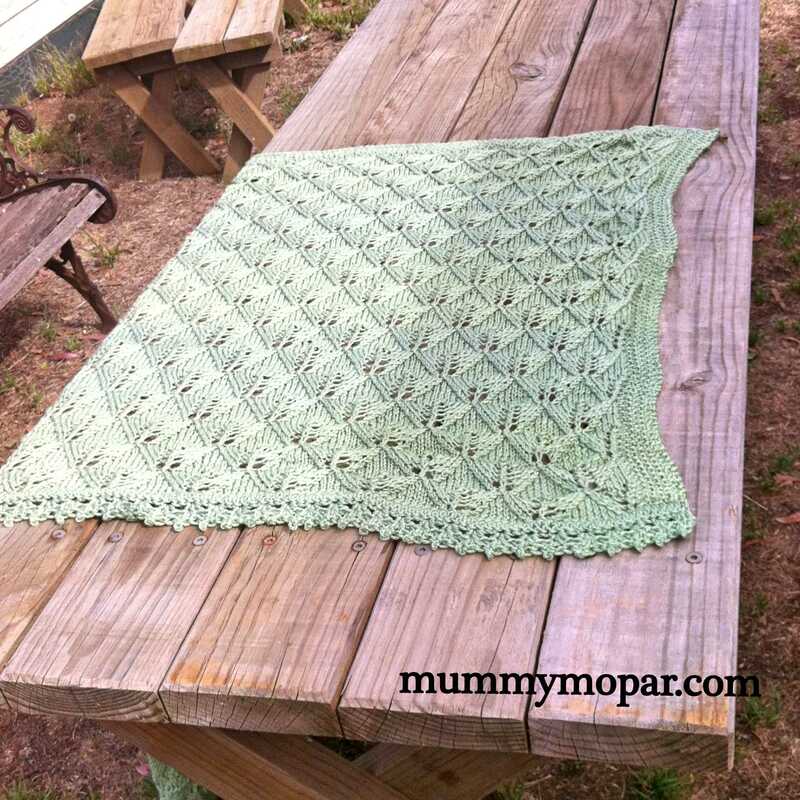 The green fern blanket is finished!! It is all washed and ready to be delivered to the mum-to-be. I had planned to do the moss stitch border all the way around, but trying to pick up the stitches from the cast on edge was extremely difficult, and looked messy. I thought it over, and decided a nice crocheted edge would work nice, but it would have to be nice and wide, and quite ornate and lacy. Normally I would have made the blanket square, but this one was a lot wider than I would normally do, and once I started I didn’t want to start over. I decided a rectangle would be nice. I think (or hope!) that the crochet edge suits the blanket. The first row was trebles, the second was treble, chain, treble in every third stitch. the third row was similar, treble, 3 ch picot, treble, in the chain space below. I think it finishes the blanket nicely, do you? Now I have started the next project, yet another bubbles shawl. Yep, another one. I find them enjoyable, since you use 5.5mm needles, it is nice and lacy. 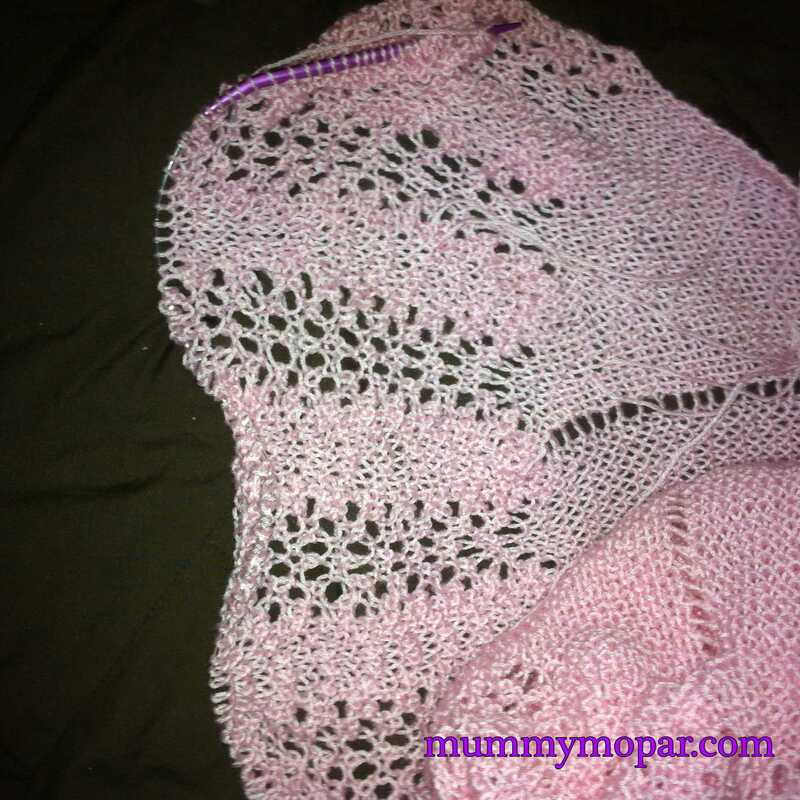 Squeak was swaddled in her bubbles blanket for the first few months, and the pattern is good as it is based on garter stitch, looks good on both sides, and isn’t very complicated to remenber the pattern repeats. Using circular needles makes it a lot easier, I am getting to the stage where I use circulars of everything. I think I am up to about 6 completed bubbles blankets over the years. 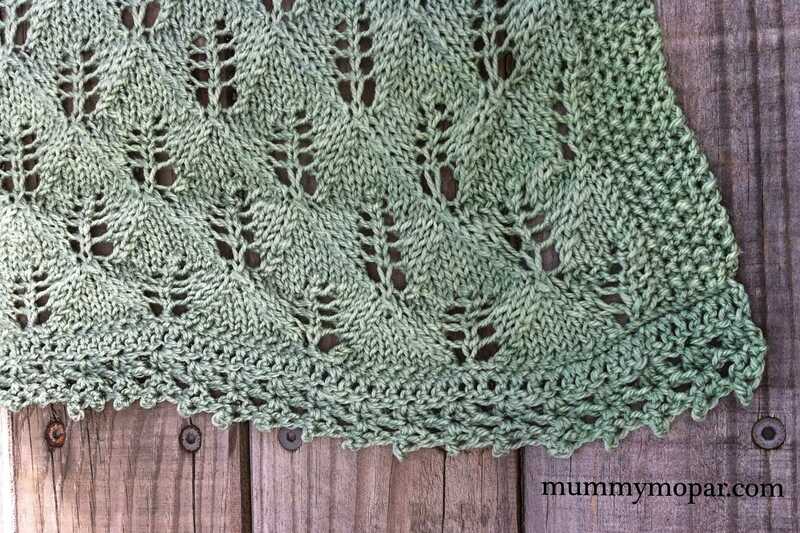 There are 17 pattern repeats in the border, and I have completed 10. I could have this finished in a week or two. The border should only take a few days, but the edging can be time consuming. Squeak loves to grab it for a ‘test cuddle’. I think I will need to make something for her next. 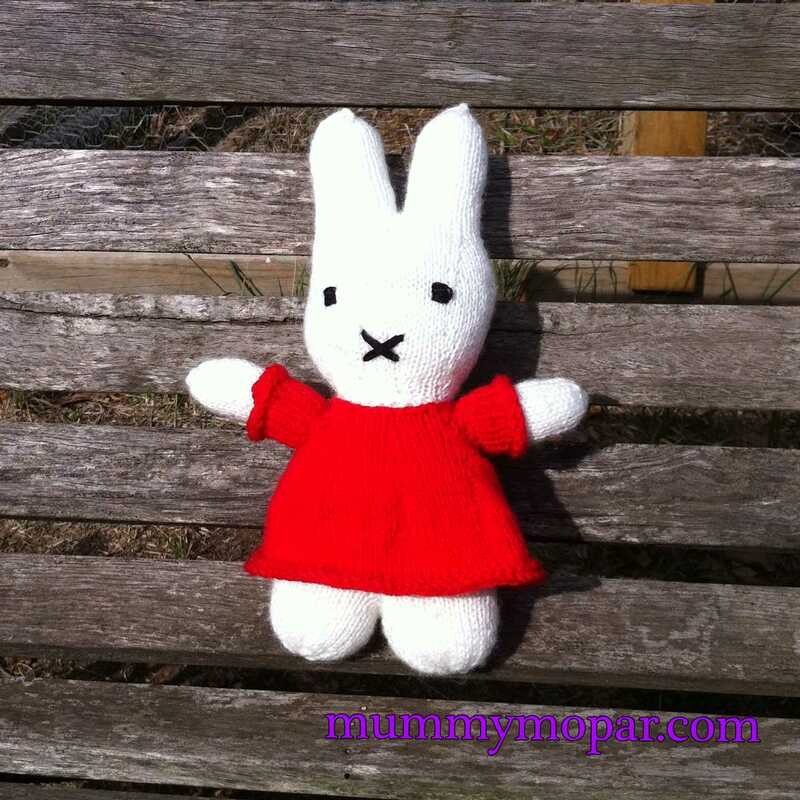 I am eyeing off a small project for Squeak for easter, a Miffy! We love Miffy, Squeak calles her ‘mishy’. I will have to buy more yarn as I don’t have the right colours, but I cannot resist making such a cute creature, and making a toddler very happy! Have you started thinking about easter?